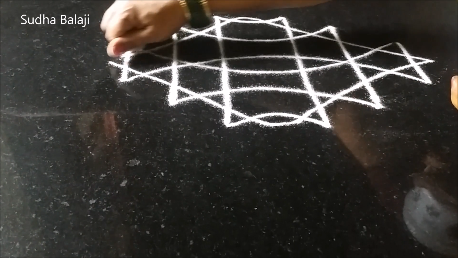 These are simple border designs drawn on either side of a kolam rangoli. 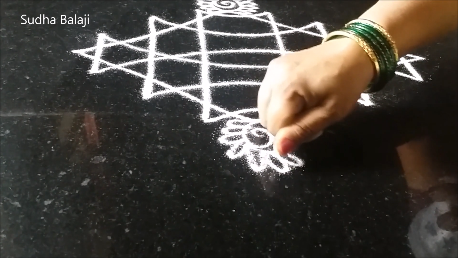 We can draw them independently also as separate rangolis. Since they represent simple kite patterns we can draw them for that theme also. The pictures show the step by step images. 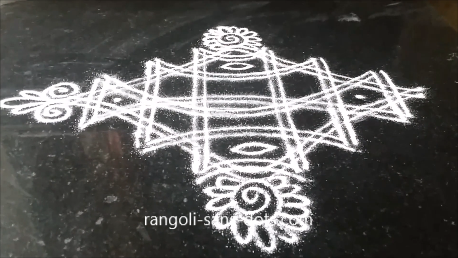 The only tricks in drawing this rangoli is the straight parallel lines and connecting curved lines should be perfect. 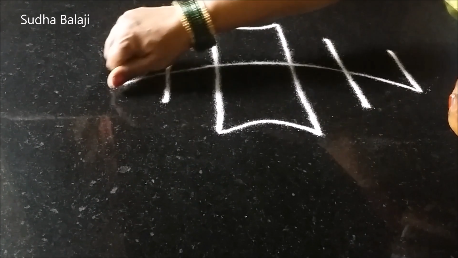 Drawing curved lines should be done in a single stroke so that we get a smooth finish. 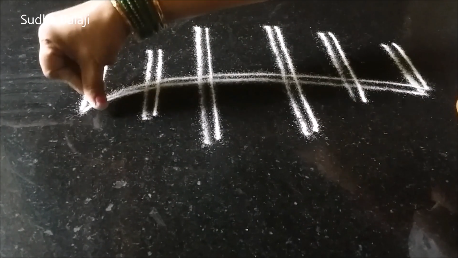 If we use many small line segments the thickness will vary and the joints are also visible. The long curved line being drawn in a single stroke. The next curved line, long one being drawn in a single stroke. 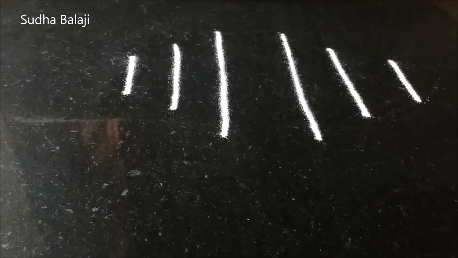 We may have to adjust the length of the lines to ensure that the straight lines to be connected are of equal length. Otherwise we will not get the correct shape of the design. 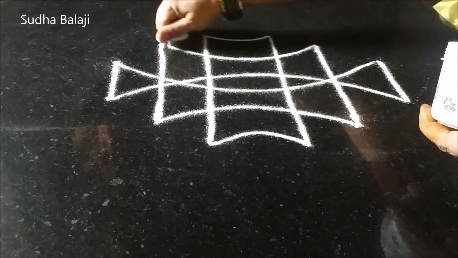 The outer curved lines , smaller in length and hence relatively easy to draw. 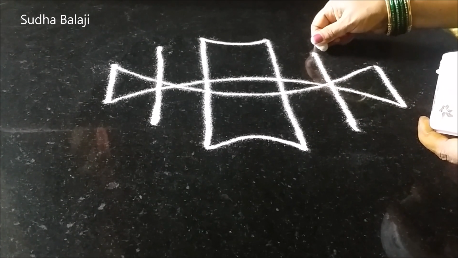 Drawing the outermost pattern as shown by the position of the hand should also be done, neatly. The design is beautiful after completion. It may be considered to represent a traditional kite also. 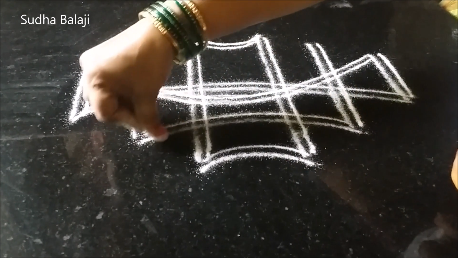 The same rangoli drawn with parallel lines. Again the curved lines should in a single stroke to ensure continuity and smooth finish. 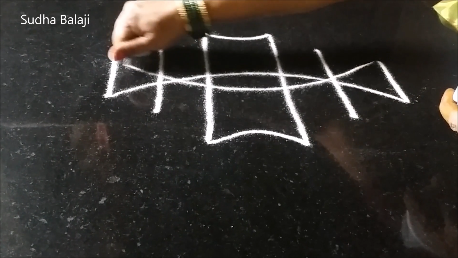 The picture below shows the position of the hand after completing the curved line in a single stretch. 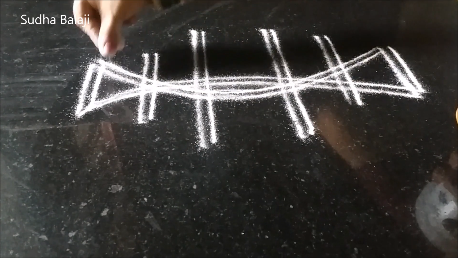 The next long curved line. 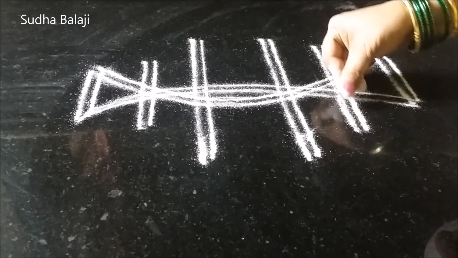 Here also adjust the length of the lines so that the top and bottom horizontal lines are almost of equal length . This is necessary to obtain proper shape of the design. 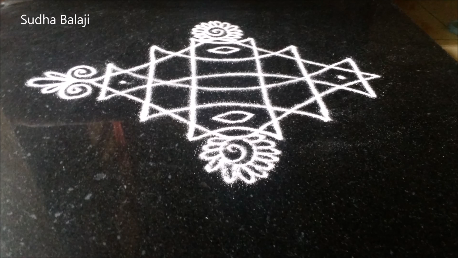 This border can be used to decorate our colourful Diwali rangoli or Varalakshmi Vratham mantapsm. 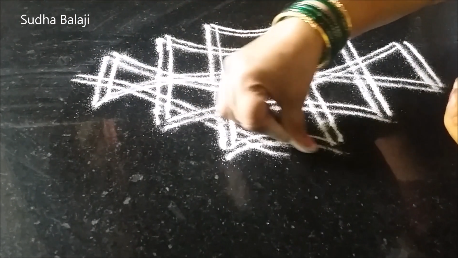 I have stopped at the white rangoli pattern. We can add colours or we can draw the whole design in colours.